Your paint color choice will set the tone for your living space. With each new home project, mistakes are bound to be made along the way. However, with the right resources and guidance along the way, you can complete any home project with ease. When it comes to painting a room in your home, preparation and organization are crucial steps to avoiding mistakes. 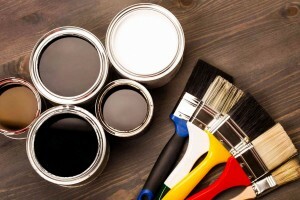 Before you begin painting, consider these four interior painting tips to avoid this year. Paint often dries differently on walls compared to how it looks on the swatch. While some bright colors may be trendy, bright shades can also be overwhelming on a wall in your home. If you love bright colors in a room, consider keeping the paint neutral and incorporating bright colors into decorative elements of the room, including pillows, lamps, or furniture. While it may seem tempting to choose your paint color first, this is a common mistake that first-time interior painters often make. This initial excitement of choosing a paint color often leads to an error because of the many considerations that should be made before selecting the color. These considerations include the amount of space in the room, furniture size and color, and the amount of lighting in the room. Before you choose your color, it is crucial to consider these other factors in the room. Your paint colors should transition from one room to the next, especially if doors are left open from room to room. If the colors of one room in your home can are visible from another, bright, contrasting, or mismatching colors can affect the overall look of your home. Your paint color choice will set the tone for your living space. With this, it is important to consider which tone you want for the design of your home. By only choosing colors based on your favorite shades, your home design will not work as a cohesive tone or color scheme. Consider whether or not your paint choices will fall into a cool or warm color tone. This choice will also help you to choose the rest of your decor over time.